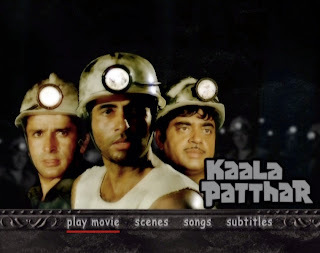 In case you couldn't guess what the message of a 1970s Yash Chopra movie about coal miners would be, let me just fill you in: "service and selflessness are the necessary and desired stars of communal good, and greed, short-sightedness, and inertia have no place here." A fine message, no? 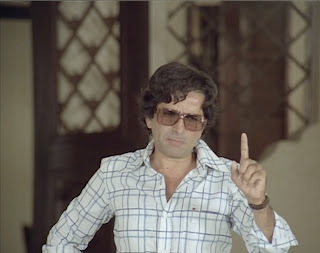 I am very much in favor of socialist-ish Bollywood as long as it doesn't get too heavy and trite, and Kaalaa Patthar* generally avoids those don'ts, despite its very predictable characters and plot. It's a little more subtle than last week's Roti Kapada aur Makaan, but not much. I bet you could accurately predict the plot just from the picture on the menu screen. Most tellingly, all three leads are in the mines, in front of but with all the other workers. But let's break it down further. Amitabh = brooder who lashes out as he tries to oppress tortured memories...will he finally break through with the love of a good woman? I should add that Amitabh was heart-breaking in this role. He played the broken, compensating Vijay so well, mixing bravery and fear in realistic way (well, relatively). Shashi = white collar, emotion-showing, well-spoken pretty boy who wins the hearts of the workers and media...but is he willing to get his hands dirty and really fight the good fight? Shatrughan (whose laze and swagger steal the show) = outlaw non-participant...will he learn to care for anyone or anything other than himself? There are some women too, though they don't get to do much, surprise surprise. Rakhee is the mine's service-minded doctor, and despite her sad face, she is very effective as a caretaker. Parveen Babi plays a famous journalist after the inside scoop on what's really going on in the mines and back office. My favorite Neetu Singh romps around the town as free-spirited peddler/dancer who trades in opinions, information, and 1-rupee magic rings. From the moment each character is introduced, you know what their arc is going to be, but it doesn't really matter, because the movie chugs along in a very satisfying way, with people learning what they're supposed to and things generally turning out for the best, but not without the Recommend Masala Allowance of sacrifice and tears. And fear not - without giving away the details, rest assured it's the criminals, those who take what isn't theirs, who suffer, and you should have known they had it coming, even if they aren't incredibly bad. Watch out where you place that heart of gold, Neetu! Let me share two little funny details, both from a scene of Mac Mohan, the local gambler, cheating at cards with some of the other miners. We hear "Tadbeer Se Bigdi Hui" from Baazi (otherwise known as the oldie in Bluffmaster's "Destiny Remix") playing on a radio in the background, which I have learned is about a (male) gambler who falls in love with a (female) doctor. Very cute, since Kaalaa Patthar has both. 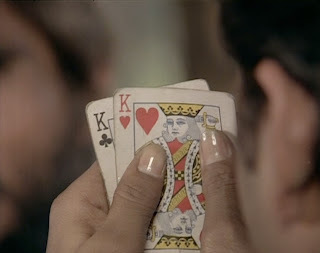 Later in the scene, we see Shatrughan looking at his cards. Are those, or are those not, the fingernails of an escaped criminal and miner? Tee hee. 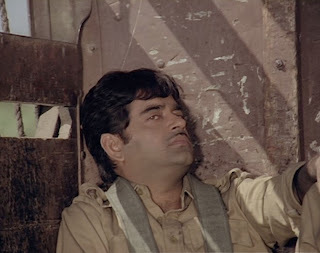 Overall Kaalaa Patthar is by no means a funny movie, but it has its lighter moments, which in my opinion kept it from getting bogged down in its own nobility. 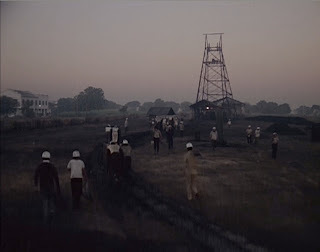 What I liked most was the repeated emphasis on community and roots: people come to the coal-mining settlement but they don't leave, except for the villain (mine owner and uber-capitalist Prem Chopra), whom we don't want around anyway. Nobody song-teleports to the mountains, because all of life, including romance, can be right here. Meet cute, marriage, children, and death are here. The source of progress is here. 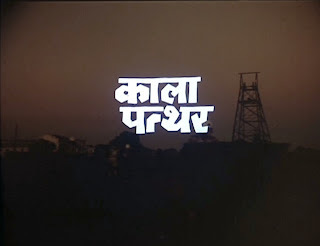 I'm not sure whether Kaalaa Patthar's town is a snapshot of just one place or an exemplary representative of India; either way, the focus on the set of people in this one place keeps the story fairly tight while still allowing sufficient drama. For Shashi fans, this movie is a particular treat in terms of his character (Ravi, the engineer just arrived at the mine), who gets to be book smart, vigilante street smart, tough, loving, and endlessly caring for others. (I am certainly not pro-violence, even in fiction, but in the community system presented in the movie, it's clearly the language that this particular trouble-maker understands.) Ravi is a fan of striving for justice and order, whether they stem from ethics, pragmatics, or physics. He's confident but never arrogant, turning all of his many skills outward to take care of people. Mmmm. Maybe this shows a shallowness on my part, but Ravi just might be the level on which this movie worked best for me. It's always so satisfying to meet a character that is very appealing in many ways, and it's even better when the character is played by your favorite. Here's a perfect Ravi moment. After beating up the local bully (two photos above) and sending a baddie flying over the balcony, Ravi retrieves his hard hat and ducks under the low-hanging roof and emerges, upright (with camera angles making him look rather taller than he actually is) and whistling, facing the sun, striding off to lobby for wage bonuses of the miners, to try to convince the boss to stop drilling a tunnel that is perilously close to water, or to comfort the son of a miner killed in an accident. (Yes, he does all these things!) "GOLDEN BOY," the shot screams. And I ate it right up. PBS's recent Jane Austen marathon has had me thinking about the 2004 poll that found that Mr. Darcy ranks as the fictional character women would most like to go on a date with (and invite to a dinner party). ** If I played this game with Bollywood characters, I think caring, personable, forward-thinking, community-minded Ravi - o noble Ravi! - would rank very high for me, although he would need to stop wearing this outfit on his motorcycle. and shoved it on Shashi. Bad. Very bad. becomes k aa l aa pa t tha r. So that's why I'm spelling it like that. (I don't always remember to look for film titles in Devanagari, but when I find them, it's time for reading practice.) And don't you love how the Devanagari and roman letters in the title (which you can see in the first picture) get the same graphic treatment? So cool! ** Like the author of this article, I have never related to the love for Darcy. He's an arse who broods, grumbles, and worries over secrets. No thanks. 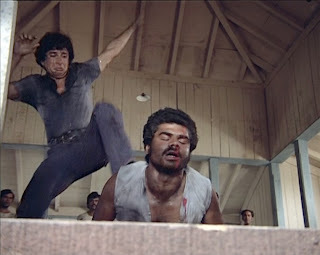 Beth, a terrific review of Kaalaa Patthar and your thoughtful responses to the film. Fitzwilliam Darcy (Pride & Prejudice): Did you know his first name was Fitzwilliam? Me neither. Too arrogant and class-conscious; on the other hand, once he realizes how wonderful Elizabeth is, he goes to great (anonymous) lengths to try to help her family. Still, no. Edmund Bertram (Mansfield Park): Too priggish (he objects to theatricals) and, though kind, a bit dense--it takes him 450 pages to figure out that he loves Fanny. So no. Edward Ferrars (Sense & Sensibility): He allows Elinor to form an attachment to him, even though he isn't free. On the other hand, he does truly love her, and behaves honorably throughout--though, it's an honor that would have doomed everyone involved to unhappiness. A little too much deus ex machina in this one; no. George Knightley (Emma): We haven't read this one yet, so my opinion might change, but from film adaptations I mainly remember him constantly lecturing and scolding Emma. That he's always right doesn't make it less annoying. No. Frederick Wentworth (Persuasion): Close, very close--but not quite. He's too bottled up, and like Darcy, too proud to show his true feelings until it's almost too late. Might be good company at the dinner table, though. Henry Tilney (Northanger Abbey): He's smart, witty, as kind as Edmund but much more fun, forgives Catherine's foibles, shares her interests, and loves her so much he's willing to propose even after he's been disinherited--but stops in the middle to make sure he doesn't compromise her, until she urges him to keep going. If I were a single woman, that would be my man. More to the point, as for Bollywood heroes similarly combining nobility and honor with passion, kindness, sweetness and strength, it's a close tie between SRK in Veer-Zaara, Ajay Devgan in Hum Dil de Chuke Sanam, and Saif Ali Khan in Kal Ho Naa Ho. But, what do I know...? Nice review on a classic. The title song by Kishore Kumar is one of my all time faves - definitely looks like Shashi is picking up style tips from one of his nephew's earlier movies! When it comes to spelling of a word from any Sanskrit based language (Hindi, Urdu, Gujarati etc.) you are right - no one really agrees. That is the beauty of the Indian languages - the spelling of them leaves no doubt on how to pronounce the word. Case in point, my name (Sanket) is pronounced Sun-kit. One of my favourites, too. As are Shashi Kapoor and Neetu Singh. Yash Chopra directed some good, socialist films with good stories, before he got stuck with gooey romances. p - once again, I must think more before I respond to you :) But in short, let me express my happiness at someone I respect (you) not digging Darcy as a romantic lead. I usually feel like the only one. Sanket - I'd been wondering how your name was spelled :) Now that I have a functional (if slow) grasp of the writing system, I'm trying to re-learn the Hindi words I think I know - undoubtedly I'm pronouncing them wrong in my head. And not like things are much better even working just in English - just think about "bow" and "bow," for example. Sigh. Banno - you must recommend me some movies, as we are clearly kindred spirits :) And so far I'm digging 70s Yash Chopra and am keen for more. Very nice post. Keep 'em coming! By the way, I don't know if you noticed that Amitabh's flashback sequence (where he is the captain of a cruise ship) is adapted from Joseph Conrad's Lord Jim. Rare to find someone like Conrad being referenced in a Hindi movie, but then again, the way Lord Jim thinks wouldn't be out of place in Bollywood! HAHAH, so Shatrughan Sinha was a metrosexual? I must have seen this movie a billion times (one of my comfort movies this one) and never picked it up. You're sharp! What I love about this movie is AB - for some reason he really shines in the quieter romances. I have never been a big fan of his hail the conquering hero romances but in movies where he lets things bubble under the surface and lets his vulnerability show - like Kaala Patthar (thats my spelling) and Trishul as well as my all time fav Mili, he is absolutely gorgeous and I want to make out with him all day. Sigh. Ahh, such a gorgeous movie! And I agree with the other comments: a comfort movie, with a bit of socialism, a wonderful Amitabh. 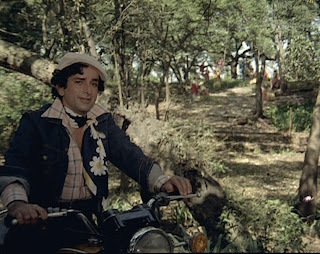 I will also add that Shashi's hotness is almost unbearable in this film and in the caps you've chosen. MOTHER OF GOD. Guh. I need to watch this one again. celluloidrant - thank you! And no, I hadn't noticed that at all - but then again, I've never read any Conrad. I'd love to know more about the reference! AB really is fab, and I agree with you about liking his quieter roles. Yelling only goes so far with me (take note, Akshaye Khanna). I still haven't seen Mili. Must! ppcc - we are of the same mind, as usual. But did you find that there were moments where Shashi looked, alternately, about 12 years old and then older than dirt? He seemed SO thin in parts of this that he looked like a little kid with a grownup's head, but then at other times, usually opposite Parveen, that he looked a lot older than his 41 years. Sigh. Still flashin' that grin, though. Pass the sunglasses. I watched that scene of him coming out of the canteen after beating up the bully about ten times. A very nice review, full of your bubbly ideas and remarks on a film I've just seen too, and tried to look at from a more serious point of view, perhaps, but you're right, the film is also a demonstration of the actors' skills, especially Shashi's, which I thought was close to useless. 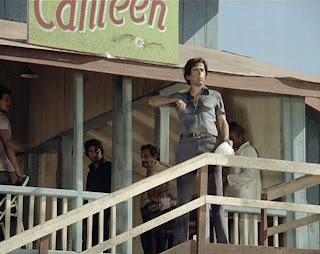 If he wasn't in the film, the story wouldn't miss him much, for Amitabh's role could easily fulfill what Shashi's does. But that's the pleasure of those productions: great actors all together, for the value-added pleasure of the spectator! Jim (his surname is never disclosed), a young British seaman, becomes first mate on the Patna, a ship full of pilgrims travelling to Mecca for the hajj. In a momentary lapse (whether of courage, or judgment, or character) during an accident, Jim joins his captain and other crew members in abandoning the ship and its passengers. A few days later, they are picked up by a British ship. However, the Patna and passengers are later also saved, and the reprehensible actions of the crew are exposed. The other miscreants evade justice, leaving Jim to face a court of inquiry alone. The court strips him of his navigation command certificate for his dereliction of duty. Jim is angry with himself, both for his moment of weakness, and for missing an opportunity to be a 'hero'. A story that roughly matches this is narrated by Amitabh to Raakhee when he discusses his past. What happens after is different from the novel, though. Yves - You think Shashi's character seemed useless? I totally disagree (obviously). I think Amitabh's character was too mired in his own past to do all of those things. Some of them, maybe, and of course he does do lots of good for other people. I also think I'd be interested to know what others think. Not sure why you don't think my analysis is serious. A light, or "bubbly," tone does not mean the content is light, or not in earnest. r - awesome! Yeah, that's pretty much it, isn't it. I like the use of "reprehensible" - very evocative, and that sense seems to echo in Amitabh's character (and his portrayal). Hi Beth - I only just got around to watching this fabbo movie. I like a socialist masala, as you know, and this really fits the bill. 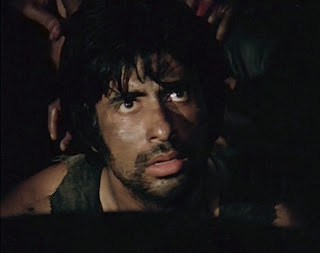 I enjoyed Amitabh's performance much more than I usually do - and I think you are right that his stillness and reserve really made his character more engaging. Although Vijay was too caught up in his own head to see what was right in front of him most of the time which was frustrating. And I am sorry but Rakhee looked more like his maa in some scenes than a love interest, but oh well. Shashi played Ravi as the ultimate golden boy didn't he? Could anyoen be that perfect? Surely he kicked cats and small children in his spare time? Otherwise people's teeth would rot just by being in the same room as Ravi. The ladies yet again did the best they could with the very litle effort expended on them by the writers. Neetu was lovely as Channo - I do like a feisty girl of the world (a bit like Rekha's character in Khoon Pasina) and she was perfect. I am still a bit unconvinced by Shatrugan Sinha - he clearly adores himself enough that my devotion is not requred,which is nice and takes the pressure off. He was excellent in this role and really played the sleazebag to the hilt. 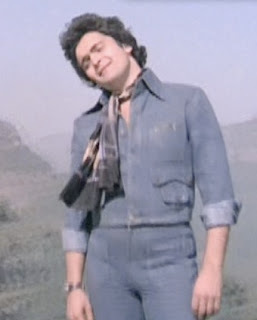 I did keep yelling at my TV that Neetu could do better and he was obviously marked for death...not by the belt as scarf fashion crime, but it just had to be the guy who went good for good that died. And Dhoom Mache Dhoom is awesome - such good fun and still serves to further character development and story. Yay!